Driving south through Metcalf on top of Beaver wall to the east of the last set of pictures. Beaver Valley road driving north from Hay Springs, as close to in order as I can remember. To where it turns east towards White Clay. From the beginning it has been clear who was her favorite. Here I spend all my time feeding and caring for her, searching Craigs list for ponies for her, and she likes her dad best. Isn’t that just how it always goes. He keeps saying that she won’t want a toy tractor or that she won’t like the clothes with cars or other such boy things on them cause “she’s a girl”. Shows what he knows. She is going to grow up knowing that she can do anything a boy can do, and do it better if she tries. She will go out with daddy in the combine. She will watch over his shoulder and learn all about computers. She will go with him and have the chance to learn about every thing he does. Don’t get me wrong she will come with me too. We will ride horses and work cows. We might even do some girly things like cook, cleaning would be taking it to far. She can be a pretty, girly sort of tomboy. Or: Don’t Worry Pretend It’s A Pony. A manual for the modern humane care and up keep of children. I have noticed in the reading of my favorite blogs ( no I do not have an addiction ) that there is a type of horse person, one of whom I used to be, that is strongly adverse to children. I know that there is the other type to who have and/or love children but this type stands out more to me. 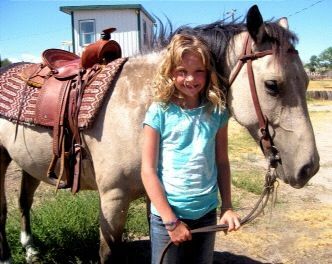 Horses fill their lives and the thought of a kid to be bothered by is not appealing. The hostility toward children can be a little startling. I think they just need to look at this from a new perspective. Hence natural babymanship. I have been beat to it though there is already a Parelli of babies. He gives clinics and sells videos along with other brand name must have items. I couldn’t believe it my idea had been stolen. Just like horse clinics he featured REAL CRYING BABIES and showed in real life how he could fix their problems in minuets. Oh well I shall have to make my fortune elsewhere. Elly is doing good at home. She eats like a horse. Every two hours day and night. It’s OK I don’t need to sleep. We are carefully exposing her to classical music and lots of Wylie and the wild west! Mostly Wylie. She is learning all sorts of new skills she can stick her tongue out and follow your finger with her eyes, she’s going to be brilliant! Elly finally came home last Sunday! It will be so nice not to have to drive to Rapid all the time. I am writing this at 12:30 at night though. So long sleep. See his swirl? High center just off to the left. One thing that Tellington-Jones doesn’t mention in her books is the importance of symmetry in a horses swirls. Not so much that the one, or two, swirls in the middle of the forehead be exactly placed, but that those on the rest of the body match from side to side. I have found mismatched markings to be a sign of imbalance. I worked with an Arab years ago on whom the fans at his flanks were completely uneven. On his right side the marking went nearly to his spine, the other side was no taller then my hand. This otherwise beautiful chestnut, I think his name was Wing Nut, was so one sided as to be nearly unrideable. The same goes for the swirls on the chest. They should be of the same basic height and length. Facial swirls that are off set can be of significance also. A recently gelded Morgan came in one time with a single whorl high and to the right as you faced him. It sat clear up and above his left eye. Usually a high swirl will mean a quieter horse but this horse had been insane as a stud and still crazy as a gelding. 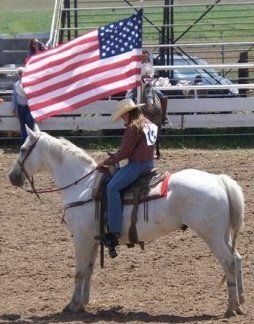 The Parelli’s have a theory on horsenality, that horses are right or left brained, like people right or left handed. Right brained equals reactive while left brain is a thinker. I believe that the direction a swirl is off set on the fore head shows if a horse is right or left brained. Are you with me still? Not sure I am. I believe the this poor former stud was so right brained, extrovert to be exact, shown by the mark waaay to the right as we look at him that he just couldn’t handle normal confined life, especially training. Maybe if some very knowledgeable person owned him and had years, since birth preferably, to work with him very slowly he might have made a riding horse. With thirty days to work with him there was no way he was going to be started hardly. Now my little Nevil is the opposite. His swirl is set slightly to the left, as you face him, and slightly high just above eye level. He is definitely left brained. Left brained extrovert I would say. He thinks hard about every thing, very curios, loves to play. I can’t help it I love to look for horses. I tried to help one of the nurses find a horse for her grandson. She didn’t want a horse for her grandson.I think she’s been avoiding me. I know it’s to early to get a horse for Elly but what am I supposed to do? Not look at Craigs list? 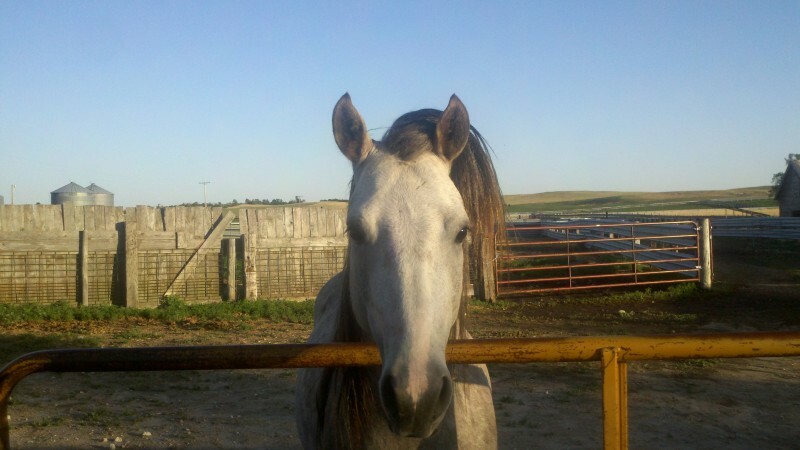 This is Earl, a well broke quarter horse/welsh pony gelding. Neck reins, moves off leg pressure and stands quiet when having his feet trimmed. We trim his feet without even haltering him, he just stands there until done. He has 4 black feet that wear like iron, and is current on all of his shots and worming. Has been used on cattle and the kids have kind of been roping off him. I don’t think I would dally up to a steer but he will let you swing a loop off him. Doesn’t have the pony attitude like a lot of ponies, has good manners and is pleasant to be around. Perfect! Maybe, five is awful young and thats more money then I would or have ever spent on a horse for me. But this isn’t for me. what could be more valuable then a good baby sitter horse to take care of my little girl? Maybe we could try him out first on Ava. Then I found this gem. 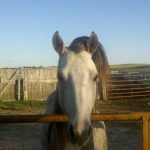 For sale 20 yr old grey gelding horse. has done everything from ranching to rodeo. Can do barrels, goats, head steers, pull calves to fire, and doctor cattle. Don’t have much time to ride him. Great horse. Twenty is such a nice age for kids horses, if a little young still. He’s big enough that grown ups can ride him and fix kid caused problems. Maybe she can start with the grey and move up to a pony. Is it the new way of training babies? Does it replace a crude out dated method with kinder gentler means? I don’t know. I know nothing about babies but when the nurses started talking about body language and watching for a baby to tell you what it was ready for all I could think about was horse training. I have always thought that training children must be the same as training anything else. Consistency mostly. Again from my completely ignorant point of view. But if we are incorporating natural horsemanship how do you make the right thing easy for a baby? So if we are supposed to watch for signs of hunger and feed them before they cry is a hungry crying baby the equivalent of a colt who has been pushed to far and is bucking? The nurses (and every one else I’m sure) probably think I crazy constantly comparing babies to bottle calves and horses. The similarities are great though and I am happy to have practiced on them before having to do the real thing. On the bright and scary side they are saying Elly might be able to come home soon.